Tucked away in Shanghai's downtown area, surrounded by clusters of high buildings, Yufo Temple (Jade Buddha Temple) is renowned for a jade Buddha statue. 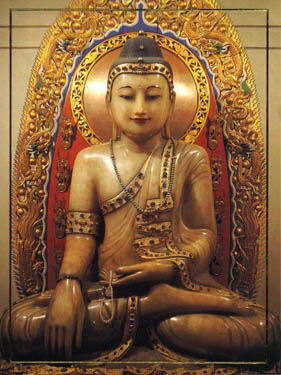 The statue, carved from white jade, has been worshipped for more than 100 years. It was brought from Myanmar by Chinese Monk Huigen on his way home from a pilgrimage to India. He was captivated by the beauty of the local jade and commissioned several statues of the Buddha. Supported by the King of Myanmar and the overseas Chinese community resident there, the monk had five statues shipped to Shanghai. He enshrined the two largest in a temple built in 1900 near the city's Jiangwan Railway Station. The temple was destroyed during the 1911 Revolution that overthrew the feudal Qing Dynasty (1644-1911). Sheng Xuanhuai (1844-1916), who had been minister of transport under the Qing, moved the statues to a temple in his home. In 1918, Yufo temple was built on Anyuan Road to house the statues. Featuring a Hall of the Heavenly King, a Hall of the reclining Buddha and the Pavilion of the Jade Buddha, the temple was constructed in the style of the Song Dynasty (960-1279). 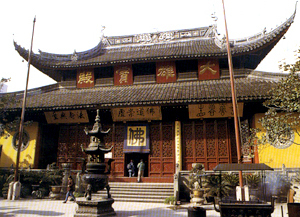 There is also a memorial hall dedicated to Li Shutong (1880-1942), who is more commonly known as Buddhist Master Hongyi. Li was a famous painter and musician who ordained as a monk in middle age.